I distinctly recall the first day of the 2014-2015 school year. It was the first time I drove carpool as a day school parent (only). I was wearing shorts, flip-flops, and a t-shirt and as I wheeled through the line, I locked eyes with my colleague Rabbi Jim Rogozen who had just replaced me as head of my children’s school. He had just returned to the headship after a brief time out and I was just beginning my first year out of the headship after nine years in. I said goodbye to my girls, waved to Jim wearing his tie and nice clothes, turned up the music and headed back to my new home office to begin the day. To be clear, I had not been unhappy in my work. Leaving my headship at the Martin J. Gottlieb Day School to become Executive Director of the Schechter Day School Network was an agonizing and bittersweet decision. We were just becoming the school that so many of us had worked so hard to begin to be; the chapter in the life of the school that I was there to help author was not complete. But I was called into service for Schechter and I ultimately answered that call. It was both that simple and that complicated. Now, I realize that nine years sounds like either a long haul or a blink of the eye depending on your vantage, but after nine years of night meetings, living and dying with each enrollment decision, going to synagogue and the supermarket with the potential for bumping into the micro-drama de jour, etc., I was ready for something different. Like so many of the happy accidents that constitute my career path, these last three years have been a blessing. Having had the chance to be on the national stage, to engage with the foundations, agencies and donors who sustain our schools, to view the field from a different vantage, to visit over 50 schools, to help reimagine what a “Schechter” education can be, to participate in the birth and launch of Prizmah, and to dig deep into educational innovation – these have all been extraordinary professional experiences. I have learned so much more from my colleagues, first in Schechter, then in Prizmah, not to mention all my colleagues in the field that I could scarcely describe it. I have also benefited from the opportunity to be more present in my family’s life than ever before. Despite a heavy travel schedule, when I’m here, I’m more here than ever before. Breakfast with my daughters each morning, carpool, the ability to participate in school activities, being home for bedtime, I know that these three years have bonded me with my family like never before at ages where my daughters still appreciate my active engagement (tick tock!). So, with all the benefits that come with not being a head of school, why am I jumping back in? And why so far North! Here is the simple truth. A career is a function of what jobs are available when you are looking, which jobs you get, which jobs you don’t get, which jobs you want, which jobs you don’t want, who else is looking, how each interview is structured (or is unstructured), who you meet when, how you respond, how you are feeling, how other people are feeling, and who knows how many other variables. It is a remarkably unscientific process considering how important it is for everyone involved. I wrote about it at length when first considering it from the other side of the search process at Schechter. When I describe my career as a series of “happy accidents,” I don’t mean to suggest that I wasn’t an active player, that I didn’t make choices or that I didn’t earn the jobs I received (or didn’t not-earn the jobs I didn’t get). I’m just being real – there are variables outside one’s control, there is a measure of luck, and sometimes the universe lends an unseen hand pushing you towards things you may not have chosen to explore on your own. Once the decision was made to leave Prizmah, I found myself back on the market for the first time in a long time. Did I consider other positions besides head of school? I did. But as my process went on, it became clear to me that my passion for the headship remained intact. Looking at my options, what was most exciting, to me, was the opportunity to apply all this new learning I have accumulated at Schechter and Prizmah to the craft of the headship. These last three years have provided me with the humility of knowing how many great ideas other people are working on at Jewish day schools across North America. These last three years have shown me what can be done at schools of all sizes, flavors and geographies. These last three years have not had the power of intimacy, relationships, community and impact that nourish my soul. We may not know the story of Canadian Thanksgiving, Boxing Day, the metric system, or a word of French, but we do know a warm (no pun intended) community when we see it. Our experiences, both professional and personal, here in Jacksonville were critical in our decision-making process this time around. I know that with generous donors, a committed Federation, a nourishing board, a passionate community, supportive parents, and talented and dedicated faculty, that you can be a school of global impact regardless of size or geography. We know that with kindness and love, that our family will thrive regardless of the number of kosher restaurants or the weather. 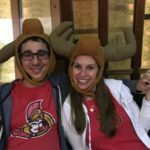 Putting it all together, when it came time for us to decide on the next chapter for our family, it was clear early on that we would seek to write it in Ottawa, Canada where I have enthusiastically agreed to become the next Head of the Ottawa Jewish Community School. I’ll have much more to say in the weeks and months ahead about the work, the school, and the move. We are neck-deep in emigration law and relocation logistics. I appreciate all the unintentional political jokes moving to Canada provides at this unique moment in time. I know it will be cold. But I also know something else. It will be great. I’ve already shared my thoughts about politics and weather (apparently very unoriginal…who knew? )…I will share that I admire your (and your family’s) willingness to proactively make big changes in order to satisfy the need for meaningful, challenging and passionate work. What you wrote here reminds me of my desire to go “back” to classroom teaching a few years ago, after many years doing more administrative and coaching work in schools. I had learned so much and had been part of creating an infrastructure of blogfolios and 1:1 devices. I felt pulled to put that learning and infrastructure to use, not as a coach, but as a teacher. I also know that it will be great….for your family because of your family’s spirit of togetherness and adventure, and also for the school. They are very lucky to get your talent and dedication, as well as the benefit of all you’ve learned these last few years. Next Next post: There is a Price to Pay for Having a Price to Pay: Where Should Innovation Live in the Jewish Day School Ecosystem?